Planning a trip to Washington, DC this December? You wouldn't be the “first family” to spend the holidays here. Holidays at the White House are a family affair…with thousands of guests. Each December, the president and their family deck the White House’s halls and opens the doors for dozens of parties and public tours. It’s a big job to prepare the country’s most famous residence for a month of celebrations. In fact, it takes about 400 staff members and volunteers to decorate the public rooms. From numerous Christmas trees to a 300-pound white chocolate replica of the White House, the First Lady and her staff devote much of December to decorating and entertaining guests from all across the country. Over the years, White House holidays have evolved from an intimate family affair in the private quarters to the national celebration that it is today. But through it all, some heart-warming traditions have developed and endured. See how the holidays have changed over the years, then compare them to your own family’s traditions. Washington, DC doesn’t always get a white Christmas, but President Andrew Jackson made sure to remedy that with an elaborate Christmas party he threw for his children and grandchildren. It included games, dancing, a grand dinner and culminated in an indoor “snowball fight” with specially fashioned cotton balls. Today, the White House remains a particularly magical place for children at Christmas. School groups and other youth-oriented civic organizations are invited to participate in many of the holiday parties and fill up on delicious holiday treats prepared by the White House chef. Prior to the 20th century, Christmas at the White House was celebrated privately. The first White House Christmas tree, pre-electricity, was decorated with candles and toys and placed in President Benjamin Harrison’s living quarters. Noted conservationist President Theodore Roosevelt didn’t believe in cutting down trees for Christmas decorations. Instead, he threw a carnival for 500 children complete with dinner, dancing, souvenirs and Santa-shaped ice cream. However, Roosevelt’s son Archie defied the Christmas tree ban and smuggled a small tree into an upstairs sewing room. Today, the environmentally friendly tradition continues with the National Christmas Tree. Instead of getting a new tree each year, a fir tree planted on the White House Ellipse is redecorated each year. In addition, the National Tree is decorated with energy efficient LED lights. President William H. Taft was the first president to have a tree in the public portion of the White House. His children helped him decorate that first tree in the Blue Room. Today, the Blue Room still hosts the official tree (one of many trees in the White House) and many presidents and their families have posed in front of it for their official Christmas photo. President Calvin Coolidge expanded the celebration beyond the Blue Room with the lighting of the first National Christmas Tree, located outside the White House in a public viewing area. The celebration became the month-long Pageant of Peace following World War II and the Korean War as a way to commemorate the end of the wars. Today, the lighting of the National Christmas Tree and the Pageant of Peace on the White House Ellipse is the centerpiece of the holidays in Washington, DC. 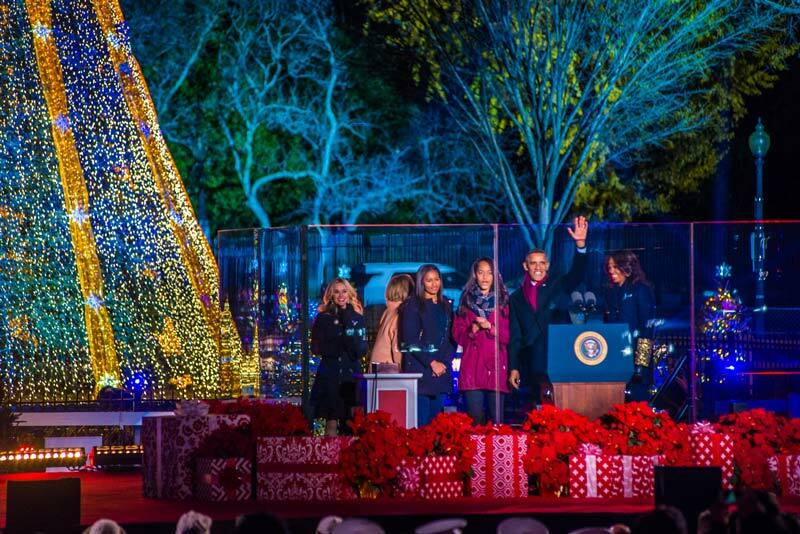 The First Family officially lights the National Tree in a special ceremony. For the remainder of the month visitors can enjoy nightly musical entertainment, visit Santa’s Workshop and explore the miniature Christmas trees each featuring homemade ornaments from all 50 states, the District of Columbia and U.S. territories. First Lady Jacqueline Kennedy started the tradition of selecting a theme for the official White House Christmas tree. That first year she selected the “Nutcracker Suite” – a popular theme. First ladies Barbara Bush and Hillary Clinton both revisited the theme in later years. Visitors who attend a White House holiday party or go on a public tour have the opportunity to view the official tree, as well as the decorations in about 10 other rooms. A commemorative program highlights the decorations in each room and their significance. Because the White House hosts so many people during the holidays, many a family has posed in front of the official Christmas Tree for their very own holiday photo. President Jimmy Carter was the first to officially recognize the Jewish holiday of Hanukkah when he lit the nation’s first National Menorah. 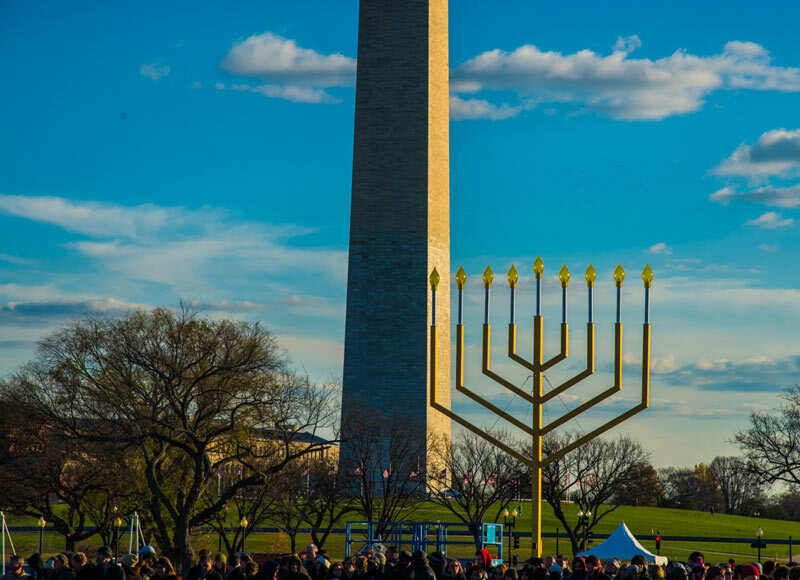 Today, the presidential lighting ceremony continues and the National Menorah is part of the Pageant of Peace. A highlight of the holiday decorations has become the white chocolate replica of the White House. A tradition since the 1960s, today visitors will find this delicious architectural feat, which can weigh up to 300 pounds and take months to create, displayed in the State Dining Room. In 1995, the White House pastry chef also created a replica of First Lady Hillary Clinton’s girlhood home on Wisner Street in Park Ridge, Ill. No detail was left unturned, including tiny stocking hung by the chimney with care. While the First Lady picks the official holiday theme, she is often inspired by American citizens. In 2008, First Lady Laura Bush selected a patriotic theme after receiving many letters suggesting the White House make it a red, white and blue Christmas to recognize the nation’s patriotic pride during war time. The National Christmas Tree and Christmas Pathway of Peace are displayed on the White House Ellipse, which is located just south of the White House and north of the National Mall. Traveling by Metrorail is the best way to see the tree, which is within walking distance from the following stops: Federal Triangle, Farragut North, McPherson Square and Metro Center. For more information on visiting the National Christmas Tree and the Pageant of Peace, visit www.thenationaltree.org.